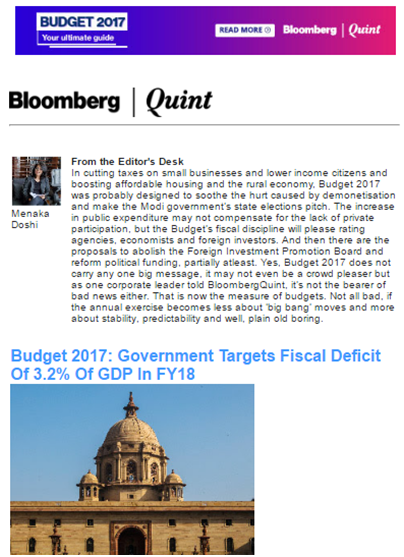 Bloomberg | Quint recently approached us for a campaign during this year’s national budget. They wanted to do two campaigns – one just a day before the budget and other after it was out. They were fully convinced that the quality of our corporate audience is top notch, for presenting their budget articles. They wanted to reach out to our entire audience base of 1.2 million subscribers. Numbers below:. The pre-budget campaign was sent out on Tuesday, 31st of January. This was more of a curtain raiser before the big event next day. Here’s the important part, the post budget campaign. They insisted on using our newsletter format with their articles and we were more than happy to oblige. This had to be sent immediately after the budget was out on Wednesday, 1st of Feb. Their editors got busy with developing the content. Time was less and Bloomberg Quint wanted their articles to reach our subscribers first. Our team worked overnight to put the content pieces together to keep things on schedule. The response was good, the newsletters were read by over 80,000 corporate subscribers. This was Native Advertising at its best! Happay is an online business expenses management software solution to track your expense workflow from purchase to accounting. They were looking to target their services to an intersection of top management, medium sized companies and our finance newsletter subscribers. On the creative side, we used the business letter format for direct mailers which helps in a number of ways. Emailers without many images have a better performance ratio in terms of deliverability and focus. The first campaign was sent in two shots with a gap of one week. The idea was to provide them quality leads. They would then nurture these leads with the help of their sales team and convert them to customers. And we did succeed in doing that. A healthy email open and click rate of 16% and 5% respectively including 80% top management folks and 217 companies were very encouraging. Some quality conversions at their end led to one more campaign for their petty cash management and travel expense management tools, which was also a success. One campaign led to another, which has resulted in a strong client-seller relationship between Happy and TradeBriefs. We were approached by a few other companies working on the same model as well. We at TradeBriefs have had 80% of our clients coming back to us with more campaigns, thanks to our quality subscribers (we don’t like to call it a database) which is quite rare in the industry. We engage them with our daily newsletters and hence the industry-best open and click-through rates. We believe in delivering quality to all our clients. Indeed one good campaign leads to another! Recently we were approached by Blue Hive, the agency handling the global marketing initiatives for Ford. 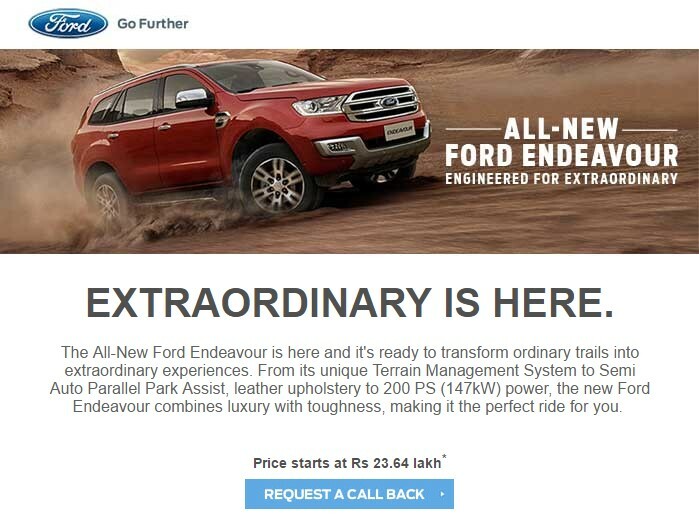 They were looking to do a branding campaign on the launch of their new offering – The All-New Ford Endeavour. They undertook 360 degree marketing initiatives – Television, Newspaper, Billboards, Online Media and so on. We helped them advertise through our email channel, to the TradeBriefs Premium audience, pan India. We worked with Ford to deliver. The direct mailers were sent out and the response was truly amazing. The email opens were close to 25% whereas the industry average is not more than 10%. 30,000 subscribers out of 1,00,000 saw the email and 2500 people clicked on the ad to know more, including 86% top management folks. The campaign was a huge success in terms of the impressions. Later on we did similar campaigns for IBM as well. The main goal here is branding and what better than showcasing it to the who’s who of India via TradeBriefs!